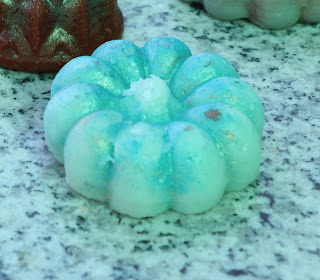 Scent Description: Blue raspberry snow, rich cream cheese bites, all topped with a lavender chamomile glaze. Cold Sniff: 5/5 A deliciously sweet and wintery blend. Think of a sweet wintery potpourri and up the sweet factor even more. Add in a little blue raspberry and that's this blend. Warm Sniff: 5/5 No surprise once melted. Melting Power: 4/5 I got about 7 hours of scent from this tart. Repurchase: Definitely! If it returns in the winter release for next year, sign me right up! Hey Liz! I am just testing comments. Please ignore if you receive. I need to melt this one. I liked it on cold and wished I had gotten some. I may still if she is offering it next payday. Well I have good news for you! *evil enabler laugh* The last update I saw said the winter collection would stay up until February!